Resteems can be annoying and hide good content in our feeds. SteemPlus new feature will allow you to let them disappear on command from your favorite social network. If you are new to SteemPlus, download and install the lightweight Chrome extension here. If you are using Opera or Firefox, there are ways to install Chrome extension on it, just check online. You do NOT need to input your username and WIF for hiding the resteems. 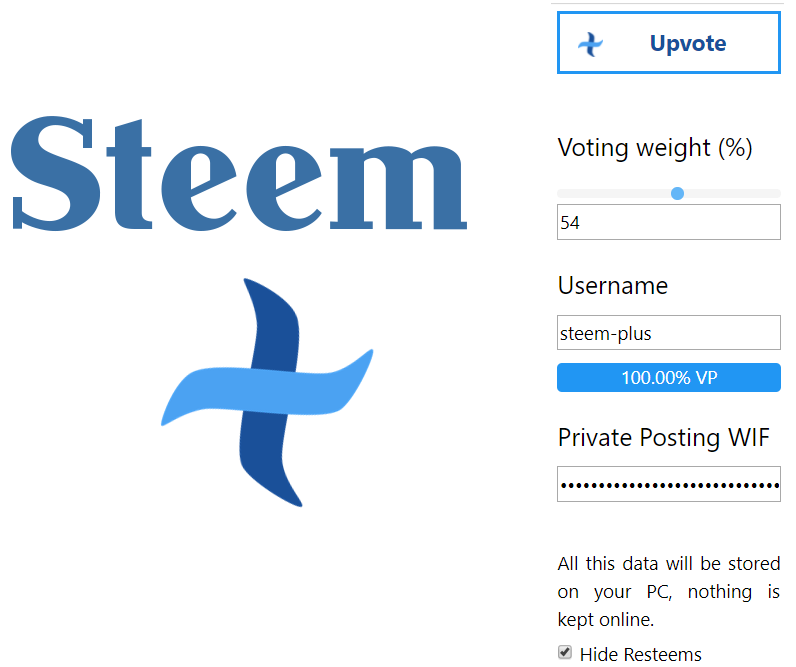 These are only required to use SteemPlus when you're a minnow and want to upvote with less than 100%! Check out our first post to see how. Just check the "Hide Resteems" box, and tadaaa... no more resteems, except your owns when checking your blog. Since not all Resteems are bad, the next update will add a whitelist/blacklist system. New tools coming soon so be sure to follow to receive the updates! Suggestions and comments are welcome. Upvotes and Resteems (paradox?) are greatly appreciated and will keep me going. Sounds useful, I'll try it. Thank you! you re welcome! hope this helps ! really? doesnt look like you read any of it though! I read this because of a resteem! Although I agree. A lot of them are annoying. Congratulations @steem-plus, this post is the third most rewarded post (based on pending payouts) in the last 12 hours written by a Newbie account holder (accounts that hold between 0.01 and 0.1 Mega Vests). The total number of posts by newbie account holders during this period was 1458 and the total pending payments to posts in this category was $922.74. To see the full list of highest paid posts across all accounts categories, click here. Nice. I'll try that out. Too much Resteems can be very annoying sometimes. Then it can get difficult to find the good content. Yes! This is one of the most commonly requested features on Steem, you are awesome for implementing it. I'll probably wait until the whitelist/blacklist feature is added... some resteems are good, when they are not too frequent. Nice feature, I am going to check it out. This is a solution to something that has been a problem for me since I joined Steemit. Thank you. I always wanted a view with just my posts and not the resteems. This solves my problem. I look forward to the addition of the white/black lists. This is great, @steem-plus. will put the extension on our desktop. I am also using chrome for mobile most of the time. Does this thing work on mobile browser? Oh shame... at least the desktop version is there.